Victoria Chau Doc Hotel is situated on the banks of the Ba ac River. 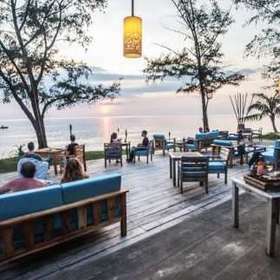 It offers views over the river and its famous floating markets, floating fish farming villages, and Cham villages. All rooms and suites are comfortably furnished, beautifully decorated and offer river views. There is an outdoor swimming pool overlooking the river and a first class restaurant offering a range of local and international cuisine. Colonial elegance and charm throughout the hotel with all the comforts of a modern hotel. 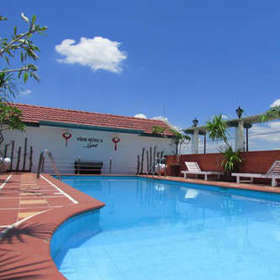 Situated right on the Banks of the Mekong River in the centre of town. In the border town of Chau Doc bridging Vietnam with Cambodia. Large airy rooms and suites with a restaurant that provides local and international cuisine. Each cabin offers all the comforts of a 4 star hotel. There is also individually controlled air conditioning in each cabin, slippers, hair dryer, wardrobe, 24 hour service. complementary minera water, And of course, an en suite bathroom in every cabin. No where in Vietnam will the service received on the Dragon Pearl be exceeded. The crew are dedicated to ensuring that all guests have the very best time while on-board. Food is traditional Vietnamese and delicious. The chefs are well chosen to ensure the highest standard possible. During a 2 night stay, weather permitting, you may have lunch on the beach or in the cave, otherwise all meals are served either on deck on in the restaurant. One of a limited number of agencies with license to travel and stay in the quieter Bay Tu Long. Excellent service from the moment of arrival to the time of departure. Excursions on kayaks, to the beach and to visit the cave are all included. Cabins match and exceed some 4 star hotels in their level of comfort and provision. 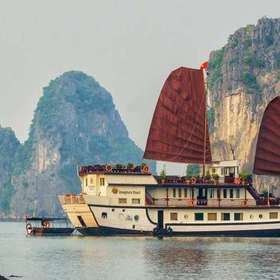 Dragon Legend is the newest member of Indochina Junk fleet, proudly marked as the high end product line, there are two ships which will be launched in 2014. Dragon Legend features 24 luxury cabins, 4 decks with both inside and outside restaurants, spa, bar, and sundeck area. 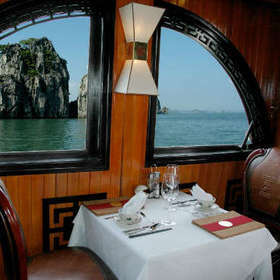 This is on board luxury and service to rival any larger cruise ship and a memorable part of any Vietnam experience. Large en suite rooms with corner bath and shower with a high level of comfort. Eight course meals for lunch and dinner offering a wide range of regional choices. Built in entertainment from a crew dedicated to making this the very best experience for everybody. All this while cruising and exploring the glorious and relaxing Bay Tu Long. These Junks are ideal for a couple, a family or a group of friends to have a private tour. Everything is designed and maintained to a high level of comfort and cleanliness. The tour can be tailor made to suit the requirements of the party on board. As with all of the fleet, staff pride themselves in providing the very best food and service. 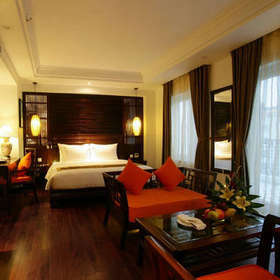 The Victoria Hotel is the only hotel in Can Tho that offers luxury 4 star accomodation and service. 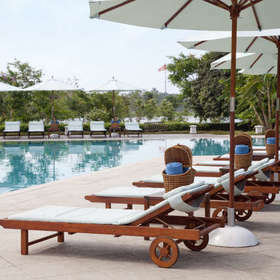 Situated on the Mekong River, it is a short walk from the centre of town. The resort blends the natural beauty of the river with the elegant design of a Colonial building to create a perfect combination. Victoria Can Tho Resort blends colonial-style architecture with the natural beauty of the river. Close to Can Tho town, this quiet retreat lies on the banks of the Hau River, set amidst gardens. Each room combines the elegance of traditional artefacts & the comfort of an international standard. 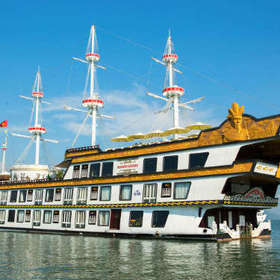 Embark on a journey with the Mekong Princess Boat for a breakfast or dinner cruise. 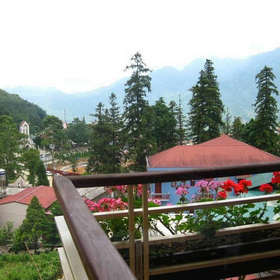 Boutique Sapa Hotel is located in the heart of Sapa town. The hotel has some breathtaking view of the surrounding mountains, including the Mt. Fansipan which is the highest mountain in Southeast Asia. One can view the entire Muong Hoa valley and the skyline of Sapa town. 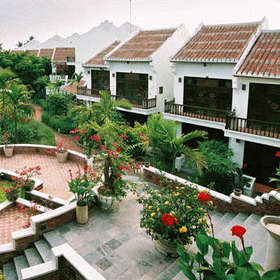 The hotel has 25 rooms and most of the rooms face either the Muong Hoa Valley and Mt. Fansipan or the scenic Fansipan Lane twisting down towards Cat Cat village. You can choose the Standard Garden, Standard City or De Luxe Mountain rooms depending on available budget. If there is more space needed, then there are also Fansipan Mountain View and Top Suite to consider. Spectacular views of the Mountain ranges including Fransipan. The kitchen opens into the restaurant so the chefs are part of the adventure of staying here. Every day, the chef of the day produces fresh cakes, perfect with a cup of Vietnamese coffee. A short walk from the centre of Sapa through the local market and on the way to Cat Ba Village. There are just three choices of rooms, the Superior, De Luxe or the larger Family Suite. With elegant and comfortable rooms equipped to Sapa Global Hotel's standard, this boutique Sapa hotel stands out with its boutique interiors, attentive personalized customer service and incomparable value for money. At Sapa Elegance Hotel, we fully realize that our success depends on customer satisfaction so we are developing the business in own way with a sincere commitment to overall quality. 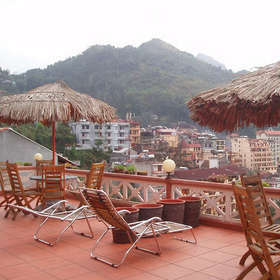 The hotel is within easy access to centre of the town of Sapa. It's situated at the top of a short hill overing spectacular views of the town and surrounding area. Its a real home from home atmosphere and very family friendly. Large balcony off the dining area where you can sit and relax with a drink or enjoy breakfast. 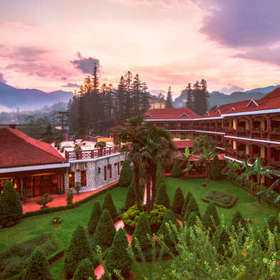 The 77 rooms at Victoria Sapa Resort & Spa feature private terrace, wood flooring and offer views over Sapa village, the resort’s lush gardens or Mount Fansipan. A warm touch of local decoration provides guests with a sense of calm in the mountain chalet atmosphere. Multi-category rooms available with private balcony with views of either Mt. Fansipan or peaceful gardens. You can choose from Superior or De Luxe Rooms, A spacious family room or one of the suites where you have the bonus of a free refillable minibar. There is a large Indoor heated swimming pool (largest of the region) which is perfect for early arrivals and late departures. As well as the lounge, it is a perfect area to relax after an overnight train journey or at the end of a days trekking. You can also opt to spend one or two night in the Victoria home stay where a local family will greet you into their home. Enjoy 4 star comfort within the culture and style of the mountains of Vietnam. A large indoor swimming pool with windows offering views of the countryside. Ideal for relaxing. Choose between travelling my the Victoria train or the Victoria coach from Ha Noi. A short walk from the centre of town offering opportunities to eat in house or in local restaurants. 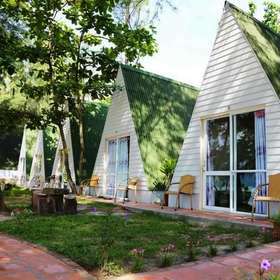 Con Dao Camping (or Glamping as it is known in the UK) offers a perfect base for exploring and relaxing. There are just three types of bungalows to choose from, the sea view has a double bed and opens directly onto the beach area. The other two types offer a double or twin beds but with garden views. All bungalows have en suite facilities. The resort has private beach with clear blue water, the comfortable rooms are built entirely of wood formthe hollow ocean hidden under the trees in a cool and romantic campus. The beach area is large enough to cater for activities such as camp fires or beach sports activities. This is perfect for those who love the simple, back to being near to nature experiences. Perfect for lots of relaxation mixed with some adventure and a little history. Direct access to a private beach for swimming, relaxing or organising some games. Within easy walking distance to shops and restaurants. The simplest and smallest of rooms is the Superior. It is also the only category of room that does not enjoy a lake view. Other categories are the Superior Lake View, De Luxe, Junior, Executive and largest of the suites, Presedential Suites with two seperate bedrooms, ideal for families or friends travelling together. Relax in the Tulip bar after a flight or a day of sight seeing. You can then choose to eat in the Tulip restaurant or wander down to the lake and enjoy a meal overlooking the lake. Da Lat is the largest town in the Central Highlands. It has a number of intersting places to see but is also a great starting point for a tour of the Central Highlands. The hotel overlooks the beautiful Xuan Huong lake. Comfortable and spacious rooms with all the amenitites. You can relax and enjoy a massage and sauna at the end of a day of touring. Within a short walking distance of the large evening market, the lake and gardens. The hotel offers a wide range of rooms from the De Luxe rooms to the suites with balconies and private gardens overlooking Hoan Kiem Lake. The hotel was designed with grandeur and elegance in mind from the moment you enter the lobby to the details in the rooms and the magnificent roof top swimming pool with views of the lake. The staff excell at creating the pefect blend of friendly professionalism and helpfulness. The hotel was named after a local art gallery that was famous for exhibiting local art work. This contemperory Vietnamese art display has been continued throughout the hotel lobby and every floor of the hotel. 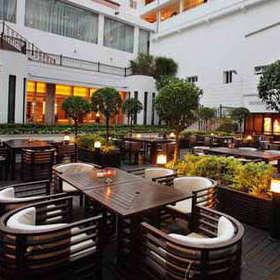 The main highlight is the hotel itself offering the very best to be expected from a 5 star hotel. The situation is almost perfect in Ha Noi, central, offering direct access to everything as it does. The restaurant accesses only the best ingredients to create delicious food. Service is professional, efficient and very friendly. From every floor to ceiling windows, charming view of beautiful westlake can be viewed from all our rooms. Rooms are tastefully decorated with warm earth tones for a relaxed ambience to ensure your comfort during stay. You can choose from the De Luxe, Grand De Luxe, Sheraton Club Room or Executive Suite with a seperate bedroom and living space. The higher the floor level, the more spectacular the view over the lake both i the daytime and nightime. If a little exercise of relaxation is for you, you can head down to the swimming pool area which is set in small but pretty gardens. And then of course, there are the restaurants offering a wide range of dishes and the cafe that, every afternoon, serves coffee and cakes to residents. The hotel overlooks the largest lake in Ha Noi, West Lake. Set in a quiet area of West Lake just 30 mins away fromt the airport and and the Centre. 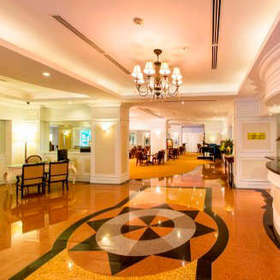 The hotel has an air of colonial elegance about it from the lobby through to the rooms. The Skylark is situated just out of the Old Quarter in a quieter area of town. Its small but very welcome after a long day of sightseeing on a hot day: the swimming pool. The rooms are large, beds are comfortable and the bathrooms are very spacious. A very relaxed yet professional and helpful staff team always ready with a smile. Despite being a short walk from the centre, the hotel is situated in a much quieter area of Ha Noi. The international buffet offers something for every taste. Rooms are large and decorated attractively with bathrooms offering all amenities. The Superior, De- Luxe, Executive and Suite rooms all have comfortable beds, elegant bathrooms and windows offering views of the city or the hotel garden. All rooms are spacious but none more than the Suite Rooms which have a seperate sitting and sleeping area for guests to enjoy. 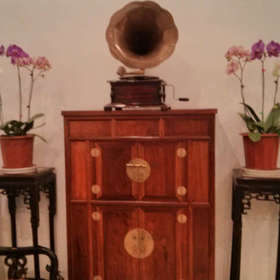 Furnishings reflect the Vietnamese style using hard wood. Bathrooms are elegantly furnished with baths and shower units over the bath. The restaurant serves a buffet breakfast and dinner and has a comfortable bar area where guests can relax before dinner with a drink. The situation is ideal for exploring the Old Quarter of the city. The in house Spa offers a comprehensive service to guests in a relaxing environment. The decor throughout the hotel is in the French colonial style of design. Rooms are comfortable with elegant bathrooms with some having views of the garden. The buffet breakfast is designed to meet the needs of our Asian and Western guests but, true to our commitment to providing excellent service, if there is anything specific that you would like, we invite you to ask and will do our best to comply. Lunch and dinner is also served in our restaurant as well as there being room service on request. At Hong Ngoc, the staff pride themselves on providing profe ional service blended with the traditional friendline and welcome of their country. The hotel is in a the central area of the Old Quarter a short walk from from Hoan Kiem Lake. The style of the hotel from the lobby to the rooms is traditional Vietnamese in decor and furniture. You will go a long way to find more friendly and obliging staff than in this hotel. Buffet breakfast exceeds the majority of 3 star accomodation offering a wide range of choices. 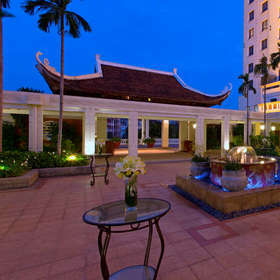 Conveniently located, The Palmy Hotel & Spa in HaNoi offers modern and elegant accommodation. Operating a 24-hour front desk, it features a restaurant and busine centre.The hotel is just 200 yards from Hoan Kiem Lake and Ngoc Son Temple. St. Joseph Cathedral is 350 yards away. Great position in a quieter part of the Old Quarter very near to Hoan Kiem Lake. Excellent food served in the restaurant at the top floor offering views of the city centre. Beautiful Vietnamese art work is displayed throughout the foyer and the rest of the hotel. Variety of rooms offers a choice to suit your budget and your needs. Hanoi La Siesta Hotel & Spa opened in 2015. It offers an elegant and friendly environment for couples and families. Ideally situated in the Old Quarter, it is within walking distance of restaurants and just 5 minutes from Hoan Kiem Lake and the Ngoc Son Temple and just steps away from the weekly night market. The hotel has a wide range of rooms to choose from. You can choose the Superior or De Luxe room if that suits your needs. But there are also the larger suites, some of which are Dulplex or 2 bedroomed. There is also a restaurant serving Vietnamese and western food, a spa and a movie room. This elegant hotel is perfectly situated in the middle of the Old Quarter. There is a wide choice of rooms and suites to choose from with unique styles and decor. Choose between eating in at the restaurant or take a short walk out into the Old Quarter. Perfect for families with the choice of 2 bedroomed suites, accessibility to town and the cinema. 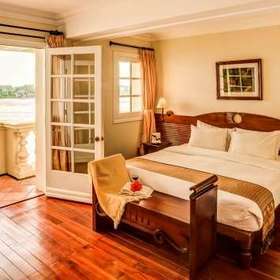 The rooms are all delightfully housed in two and three storey French colonial style buildings, surrounded by tranquil garden and situated by the river with just a short walk to the centre of Hoi An town. The swimming pool area is spacious and beautifully set out for an ideal afternoon of relaxing with a drink. And when that all gets too much, there is also the magnificent Spa to retreat to. The whole place is designed with a fusion of graceful European and tropical Asian styles, a host of modern comforts provides a luxurious home away from home, full of enchanting local inspirations. Riverside Location just a short walk from the town of Hoi An. The hotel exudes an air of calm and elegance that is very welcoming. Spacious rooms designed with a raised area for the bed and a sitting area to the front. You can choose from the Garden Superior room to the Palm View Villa. Which rooms you choose, you can be sure that you will enjoy high levels of comfort and amenities. The houses are built around a central courtyard area of trees and plants that lead down to the swimming pool, dining room and bar. As well as double, twin triple rooms, there are also connecting rooms ideal for families or for a group of friends. The hotel is situated in a perfect position overlooking the rice paddies and half way between the town of Hoi An and the beach. The shuttle bus is always on hand to transport you to either destination. The beach is a private beach reserved for guests staying at one of the 3 Ancient Village hotels in Hoi An. 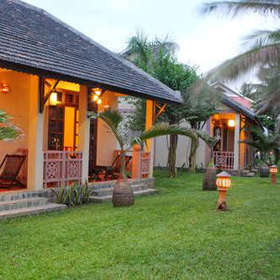 The hotel is in an idyllic position halfway between the town of Hoi An and the Beach. You can relax at the swimming pool overlooking the countryside or visit the spa. Staff pride themselves in providing a personal, friendly and helpful service to all guests. 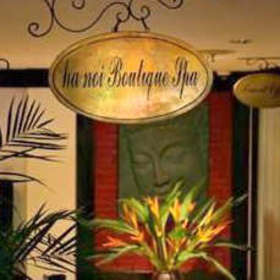 The restaurant serves Asian and Western dishes and, above all, the specialities of Hoi An. The Homestay is in a rural location a short walk from the centre of Hoi An Town. You can choose to relax in the swimming pool situated in the gardens. 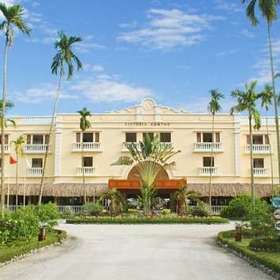 The resort offers a lovely riverside location yet adjacent to the beach. 121 rooms and suites decorated in all of which evoke a traditional Vietnamese village style. Choose between the River Breeze and the Sunset Grill for your dining pleasure. The hotel is set in extensive gardens with direct access to a private beach. The hotel offers a wide range of resources for the family including games room and spa servcies. The Swimming Pool is situated centrally on the estate surrounded by beautiful gardens. It has a perfect location, on the beach with easy access to local restaurants & short drive to town. The hotel is located in the tranquil district of An Hoi, on the banks of the romantic Thu Bon River and within 10-minute walking distance to the ancient town of Hoi An. The facilities include an internet corner, a spa & fitness centre and a large swimming pool that ofers opportunity for swimming or just plain relaxing. There are three types of rooms to choose from, the De Luxe with a view of the pool, the Emerald De Luxe with a river view or the Emerald Suite which offers a river, garden and pool view. The position of the hotel offers a lovely river frontage yet a short, easy walk to the centre. Choose between a pool or river view or you might go for the Suite with a view of both. The hotel is very welcoming and friendly with a relaxed yet professional manner. The restaurant offers a wide ranging cuisine with local and international menus. A couple can enjoy their stay in a Deluxe room or Suite while a Family room with balcony or a Luxurious Pool View Suite with connecting rooms are large enough for a family of 4/5. From the hotel, you can take a leisurely stroll into the Old Town or nearby Thanh Ha Pottery village. In addition, we run a shuttle bus service to places further afield such as to An Bang Beach. Alternatively relax and enjoy the hotel environs - the garden pool, have a drink in one of the hotel bars overlooking the rice fields, work out in the gym. Or for those seeking serenity and rejuvenation enjoy our extensive spa menu at La Siesta Spa hidden within the lush garden. Set in a tropical garden, the style embodies authentic Hoi An charm mixed with modern influences. The redbean restaurant serves a choice of cuisines or you can get a snack at one of the 2 bars. You can explore the rich heritage of Hoi An at the Beach Boutique Resort. You will enjoy authentic Vietnamese cuisine and hospitality throughout your stay. Each room and villa faces the sea. All have large balconies or terraces for privacy and relaxation. The dsign of the resort glows with freshness and invitation from the first entrance into the lobby, through the generous gardens where all of the accomodation is situated onto the large swimming pool just steps away from the beach. There is a regular shuttle bus to go into Hoi An town centre. Direct access onto the private beach. You can choose from a great in house restaurant, the local beach restaurants or Hoi An town. A short drive or cycle ride into the ancient town of Hoi An. Very elegant decor throughout the hotel with all rooms and villas having a large private areas. There are four choices for staying in the Asia. You can choose the De Luxe or the Executive De Luxe rooms or the larger Junior and Asia Suites. There is a restaurant but for dinner, you are perfectly situated on the main street of Hue where most of the bars and restauants can be found. Some of the rooms and Suites on the upper floors offer lovely views over the Perfume River which is just a very short walk away. And after a long day of sight seeing, you might want to relax by the roof top swimming pool that offers lovely views of the city. Swimming pool on the top floor with lovely views over the city. Perfect situation for taking a walk along the Perfume River especially beautiful at night. La Residence Hue Hotel & Spa is a boutique hotel on the banks of the fabled Perfume River overlooking the former Imperial Citadel. Endowed with opulence and warmth, this former residence of the French Colonial governor has been painstakingly restored and refashioned into an exceptional hotel. There is a great selection of rooms from Superior to De Luxe to the magnificant suite with the circular window that was once the home of the Governor of Hue during the French occupation. You can enjoy the beautiful gardens spreading down to the river, go on a romantic dinner cruise, indulge yourself in the Spa or simply relax by the pool. The town of Hue is a short walk away along the banks of the Perfume River. The grounds and the hotel itself are in the banks of the Perfume River. It oozes colonial charm in the elegance of the buildings and the gardens. 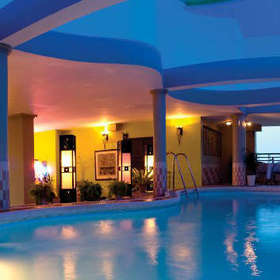 Of course, you can also indulge yourself in the wondeful Spa or simply relax by the pool. 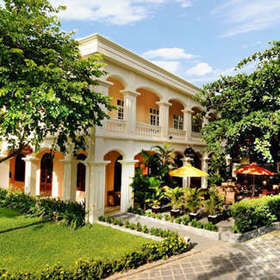 Hotel Saigon Morin is awarded as Top 5 best historic hotels in Vietnam and one of the most classic hotels in Hue City. Striving to maintain its charming, the hotel offers the most comfortable stay for all the guests. There are 6 different categories of rooms and suites all offering the same degree of Colonial charm. The rooms are Colonial De Luxe, Premium City View and Premium River View. For more space and added facilities, there are the Colonial, Morin and Executive Suites. The outside dining is charming surrounded by statues and plants. You will also be entertained by some local artists singing traditional Vietnamese songs. And of course, there is the pool and Spa. Situated on the side of the Perfume River, it is a perfect location. The central courtyard offers opportunities for open air dining and relaxing by the Pool. Rooms are spacious, grand and luxurious offering a flavour of bygone days. Small, simply but elegantly decorated and maintained, the Mai Chau Valley View Hotel excels at what the local Ethnic group of White Thai people are good at and that is a warm hospitality. Your host will be very happy to help with any questions about the area and about the lives of the people. An excellent budget hotel where costs are low and service is high. A perfect position overlooking the rice paddies and very near to the Ethnic village. An undoubted highlight is the level of hospitality received from the owner of the hotel. Simple but very comfortable rooms with spacious on suite bathrooms. Most rooms with lovely views. Modeled after Thai stilt homes, Mai Chau Lodge has 16 intimate rooms and suites with private balconies and inspiring views of either the mountains or the valley. Guest rooms feature local textiles and décor and are furnished with Western-style bedding, en-suite bathroom, satellite TV, telephone, climate control unit, tea and coffee making facilities and mini bar. Services include laundry, pressing, evening turndown and complimentary internet access. The restaurant is large and comfortable offering a wide range of cuisine in a great atmosphere. A local Ethnic dance troupe perform traditional dances nightly. Small, charming and offering a warm local welcome, the lodge is comfortable and elegant. Swimming pool holds a great interest especially after a hot day of trekking or cycling. Restaurant offers a wide range of local and international food with ethnic dancing as entertainment. The Mai Chau Ecolodge was built entirely from natural materials with thatched roofs, bamboo interiors, wooden furniture and outdoor jungle showers. Every bungalow was meticulously designed to embody the local stilt house style and traditional Thai ethnic culture. The absence of television and other entertainment facilities keep our lodges true to what it stands for – a place to get back to nature. There are a wide range of rooms and suites to choose from including a suite with a private pool. The setting of the Lodge is stunning in probably the best areas of the valley. 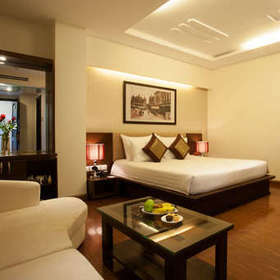 Rooms and suites are elegant and magnificently decorated offering style and luxury to its guests. There is a large swimming pool in the centre of the development, next to reception. Excellent restaurant providing first class food as well as spectacular views over the valley. Built in a rural architectural style, Tam Coc Garden evokes the image of an authentic Tonkin village with tile-roofed stone houses, green bamboo hedges, lush paddy fields and cultivated vegetable gardens. Staying here is a great way to discover the living environment of Tonkin farmers and to learn more about green and cultural tourism. You can choose from 3 types of rooms. The Superior room has a garden view, the De Luxe rooms are overlooking the rice field and limestone peaks. The Premium rooms offer a wide view over the rice fields and limestone peaks. 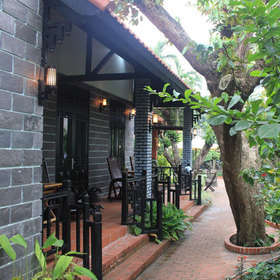 The hotel is built in the style of aTonkinese village with typical stone houses and tile roof. A beautiful setting urrounded by paddy fields and limestone peaks. Rooms are simple, elegant and very comfortable. You can enjoy the swimming pool, the spa or choose to join in with one of the activities arranged. Located on the edge of the Van Long Nature Reserve, Emeralda Ninh Binh Resort offers spacious, villa-style rooms. 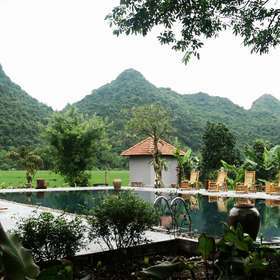 Surrounded by landscaped gardens, it features a spa, 3 swimming pools and 2 restaurants.Emeralda Ninh Binh Resort and Spa is a 30-minute drive from the Tam Coc-Bich Dong caves. Set in the middle of the National Park, the hotel is surrounded by beautiful countryside. This is the perfect get away place to stay. You can choose from the range of rooms and services. The restaurant sources all organic and local produce to put into their meals. There is a mini gold course, a 'kids club' and opportunities for taking the cow cart tour. 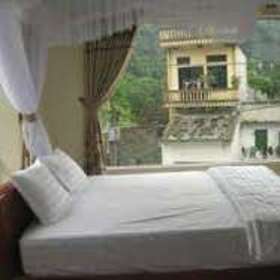 Limestone View Homestay is situated in Ninh Binh, Vietnam and features rooms with free Wi Fi acce and views of the lake, countryside and mountians. It has a restaurant and offers compliementary bicycle use. Rooms have a terrace and air conditioning. The en suite bathroom offers shower facilities and toiletries. Dramatic setting in the countryside surrounded by rice paddies and limestone karsts. You will be guests of a local family who will do everything to make your stay a true home from home. Enjoy delicious home made Vietnamese food. Great place to relax or explore the area. The minimalist villas offer free Wi-Fi, flat-screen TVs, and minifridges, as well as outdoor bathtubs, and furnished terraces with gulf views. Upgraded villas add outdoor shower stalls and whirlpool tubs; some have their own pools. Depending on budget and needs, you can choose from Sea View Villas, Beach Front Villas, Jacuzzi Villas and the larger 2 bedroomed version. Chen Sea Resort & Spa has been designed to be fully integrated in the unspoiled and natural environment of the bay. The Architecture is inspired by the local environment with the use of natural material and traditions of Vietnam. The open plan layout design with stunning view on the ocean is an invitation to an indoor/outdoor experience. The minimalism décor combined with the natural beauty surrounding the resort offers an ultimate haven. All the Villas are equipped with modern in-room amenities that ensure maximum comfort with large living space from 78 to 240 square meters, and feature generous furnished terrace. A comfortable hotel on the beach offering all the very best of amenities. Ample opportunities for seclusion or for sharing in with the general activity of the hotel. Renowned cuisne served in the Il Ristorante restaurant indoors or outdoors on the terrace. Sunsets to write home about. Watch over dinner, while on the beach or at the end of the jetty. The hotel offers a wide range of rooms, bungalows and villas to choose from. The smallest space is the recently re-furbished Veranda rooms leading onto a large shaded and wooden Veranda, facing the sea and offering a four-poster double bed and enclosed bathrooms. The top of the range is the Reef House. The Reef House is a large private house with catering facilities, surrounded by garden and set on a ridge overlooking the sea. It contains two en-suite double bedrooms, each with an open air bathroom and an open plan living and dining room. Perfect for a family or group of friends. Breakfast and other meals can be served at the Reef House for a small extra charge. If you love rustic, direct access to the beach, activities on tap and you don't mind the lack of air conditioning, this is an idyllic place to visit. Direct access to the lovely beach of Phu Quoc Island with water activities available. Wide range of choices of accomodation all in rustic and comfortable rooms, bungalows and a house. Delicuous tapas and main meals served at the restaurant on the delightful terrace on the beach. Gardens as well as beach to explore. This is a perfect place to relax and enjoy nature. In addition to 70 rooms with private balconies, La Veranda Resort Phu Quoc features two restaurants, a lounge bar, swimming pool, water sports and day spa, all in front of the beach and beautiful grounds, making it a remarkable setting and unique experience for weddings, civil unions, ceremonies, birthdays, and reunions of family or friends. There are a wide range of rooms to choose from to suit the size of your party, budget and needs. The top of the range is for travelers accustomed to ultimate luxury and the budget to match. This enormous villa facing the sea is all bespoke elegance and comfort. Featuring a living area, spacious bathroom with separate bathtub and shower, a large terrace with private manicured garden, guests can soak in the island sunset right from their villa. For a less exhuberent choice, you might go for the Superior or De Luxe rooms with either garden or sea view. Whatever you choose, you can expect luxury, comfort and style. The position on the beach cannot be bettered. Sunsets are consistently spectacular. The hotel is elegant and comfortable throughout. On an island where service is good, at La Veranda, you can enjoy excellence. You might want to arrange a candle lit private dinner on the beach for yourself and your loved one. Mix luxurious relaxation with learning how to cook Vietnamese food with the resident chef. The hotel has twelve luxurious rooms available in Standard room, Signature room and Deluxe room types. The rooms are furnished in French and Italian styles with a private balcony and an en suite bathroom. The Little Bistro Restaurant serves Asian and European signature dishes on a French farmhouse wood table surrounded by modern leather and ladder-back chairs. 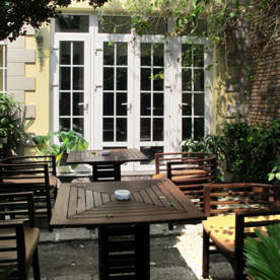 La Villa French Restaurant is located in a quiet street of Thao Dien and has a cosy dining room. La Villa has two venues, indoor and outdoor. You can choose to dine in the cosy dining room or in the beautiful and romantic garden by the pool which is in the middle of several species of flowers. 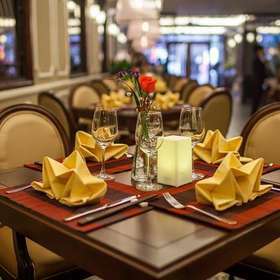 La Villa French Restaurant serves authentic and fine French cuisine. The proximity to the river offers guests an opportunity of taking a stroll along the river. Its a great location. Not in the noisest part of the city but within easy reach of all amenities. A small but very inviting Bistro which serves a wide range of food including French cuisine. The hotel boasts of many restaurants and bars. 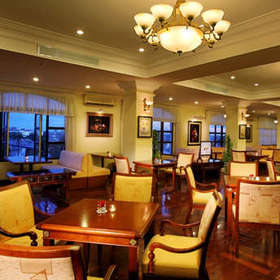 All restaurants face the Saigon River and provide free internet acce and Wi-Fi. The Catinat Lounge located on the ground floor serves drinks, cocktails and fruit juices. The Cyclo Restaurant features a variety of traditional Vietnamese cuisine and traditional Vietnamese music performance every evening. The Merry Pool Bar located on the first floor serves cocktails, fruit juices, beers and snacks. 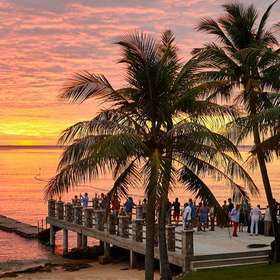 The Breeze Sky Bar is a semi-island alfresco bar dining venue with buffet breakfast, dinner and a la carte. The Serenade Restaurant serves European cuisine, a la carte and set menu with sounds of piano in the background. The M Bar entertains you with live music bands and it serves alcoholic & non-alcoholic beverages, selection of wine and finger food. 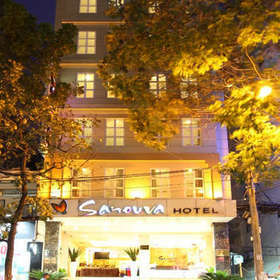 Sanouva is centrally located in district one of HCM City offering great access to all amenities. 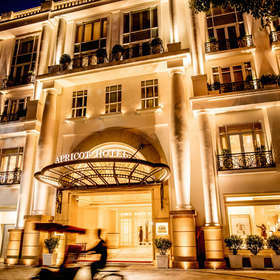 Located on Ly Tu Trong Street, the 4 star Grand Silverland Hotel & Spa is Tan Hai Long Hotel Group’s latest addition to its Collections in the vibrant Ho Chi Minh City. The hotel offers 89 guest rooms including Deluxe, Premier Deluxe, Executive and Silver Suite with high class branded amenities and entertainment facilities such as Roof Garden Restaurant where guests can enjoy a special night dinner under the candle lights or guests can swim in the Rooftop Swimming Pool, overlooking the spectacular city landscape. What’s more, KL Spa is a preferred choice of most couples seeking for a pure retreat and escape in the busy Saigon or golfers can enjoy a practice on the Mini Golf located on 7th Floor, which they cannot find at any hotels in Saigon! The Hotel is in a central position in the city, ideal for accessing the main commercial centre. 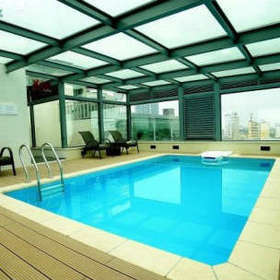 The roof top swimming pool and 7th floor mini golf course are additional but welcome benefits. The restaurant offers Weekend Dinner Buffet an abundant selection of premier steaks and seafood. Each cabin offers all the comforts of a 4 star hotel. There is also individually controlled air conditioning in each cabin, slippers, hair dryer, wardrobe, 24 hour service. complementary minera water, And of course, an en suite bathroom in every cabin.&nbsp;<br /><br />No where in Vietnam will the service received on the Dragon Pearl be exceeded. The crew are dedicated to ensuring that all guests have the very best time while on-board. Food is traditional Vietnamese and delicious. The chefs are well chosen to ensure the highest standard possible.&nbsp;<br /><br />During a 2 night&nbsp;stay, weather permitting, you may have lunch on the beach or in the cave, otherwise all meals are served either on deck on in the restaurant. The hotel offers a wide range of rooms from the De Luxe rooms to the suites with balconies and private gardens overlooking Hoan Kiem Lake. The hotel was designed with grandeur and elegance in mind from the moment you enter the lobby to the details &nbsp;in the rooms and the magnificent roof top swimming pool with views of the lake. <br />The staff excell at creating the pefect blend of friendly professionalism and helpfulness. The hotel was named after a local art gallery that was famous for exhibiting local art work. This contemperory Vietnamese art display has been continued throughout the hotel lobby and every floor of the hotel. The buffet breakfast is designed to meet the needs of our Asian and Western guests but, true to our commitment to providing excellent service, if there is anything specific that you would like, we invite you to ask and will do our best to comply. &nbsp;Lunch and dinner is also served in our restaurant as well as there being room service on request. At Hong Ngoc, the staff pride themselves on providing profe ional service blended with the traditional friendline and welcome of their country. 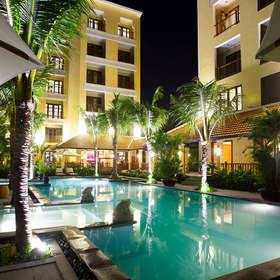 Conveniently located, The Palmy Hotel &amp; Spa in HaNoi offers modern and elegant accommodation. Operating a 24-hour front desk, it features a restaurant and busine centre.The hotel is just 200 yards from Hoan Kiem Lake and Ngoc Son Temple. St. Joseph Cathedral is 350 yards away. 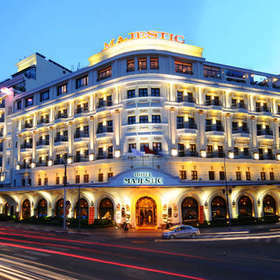 Hanoi La Siesta Hotel &amp; Spa opened in 2015. It offers an elegant and friendly environment for couples and families. Ideally situated in the Old Quarter, it is within walking distance of restaurants and just 5 minutes from Hoan Kiem Lake and the Ngoc Son Temple and just steps away from the weekly night market. The hotel has a wide range of rooms to choose from. You can choose the Superior or De Luxe room if that suits your needs. But there are also the larger suites, some of which are Dulplex or 2 bedroomed. There is also a restaurant serving Vietnamese and western food, a spa and a movie room. There are four choices for staying in the Asia. You can choose the De Luxe or the Executive De Luxe rooms or the larger Junior and Asia Suites. There is a restaurant but for dinner, you are perfectly situated on the main street of Hue where most of the bars and restauants can be found. &nbsp;Some of the rooms and Suites on the upper floors offer lovely views over the Perfume River which is just a very short walk away.&nbsp;<br /><br />And after a long day of sight seeing, you might want to relax by the roof top swimming pool that offers lovely views of the city. La Residence Hue Hotel &amp; Spa is a boutique hotel on the banks of the fabled Perfume River overlooking the former Imperial Citadel. Endowed with opulence and warmth, this former residence of the French Colonial governor has been painstakingly restored and refashioned into an exceptional hotel. There is a great selection of rooms from Superior to De Luxe to the magnificant suite with the circular window that was once the home of the Governor of Hue during the French occupation.&nbsp;<br /><br />You can enjoy the beautiful gardens spreading down to the river, go on a romantic dinner cruise, indulge yourself in the Spa or simply relax by the pool. The town of Hue is a short walk away along the banks of the Perfume River. The hotel offers a wide range of rooms, bungalows and villas to choose from. The smallest space is the&nbsp;recently re-furbished Veranda rooms leading onto a large shaded and wooden Veranda, facing the sea and offering a four-poster double bed and enclosed bathrooms. The top of the range is the Reef House.&nbsp;The Reef House is a large private house with catering facilities, surrounded by garden and set on a ridge overlooking the sea. It contains two en-suite double bedrooms, each with an open air bathroom and an open plan living and dining room. Perfect for a family or group of friends. Breakfast and other meals can be served at the Reef House for a small extra charge. <br /><br />If you love rustic, direct access to the beach, activities on tap and you don't mind the lack of air conditioning, this is an idyllic place to visit. The hotel boasts of many restaurants and bars. All restaurants face the Saigon River and provide free internet acce and Wi-Fi. The Catinat Lounge located on the ground floor serves drinks, cocktails and fruit juices. The Cyclo Restaurant features a variety of traditional Vietnamese cuisine and traditional Vietnamese music performance every evening. The Merry Pool Bar located on the first floor serves cocktails, fruit juices, beers and snacks. 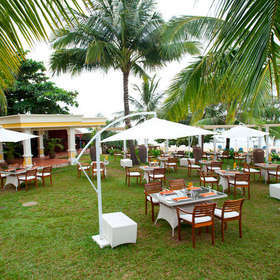 The Breeze Sky Bar is a semi-island alfresco bar dining venue with buffet breakfast, dinner and a la carte. The Serenade Restaurant serves European cuisine, a la carte and set menu with sounds of piano in the background. The M Bar entertains you with live music bands and it serves alcoholic &amp; non-alcoholic beverages, selection of wine and finger food. Rather than adopting the local or international ratings which can sometimes be misleading, we have devised our own rating system based on our own experience and those of our guests. You may choose to experience the rich heritage of Kerala by staying in a boutique resort or want to stay within a beautifully manicured five-star luxury resort which combines architectural elegance and luxury with first class service pandering to your every need; or you may just want to experience ‘real-life Kerala’ by living with a family in their guest house. Whatever your requirement, Kerala guarantees its visitors a choice of accommodation with good standards of hygiene and service. What makes Kerala special is its authenticity. No matter what the category of the property, you will find the design is in keeping with the rich local architecture and each resort blends in with the natural surroundings thus providing you a ‘real’ Kerala experience. Boutique hotels differentiate themselves from larger chain/branded hotels by offering a personalized level of accommodation and services/facilities. A heritage hotel is accommodation which has been built using either whole or partly reclaimed materials to recreate the history and authenticity of buildings from a bygone era. There is normally a good array of facilities at the larger resorts.